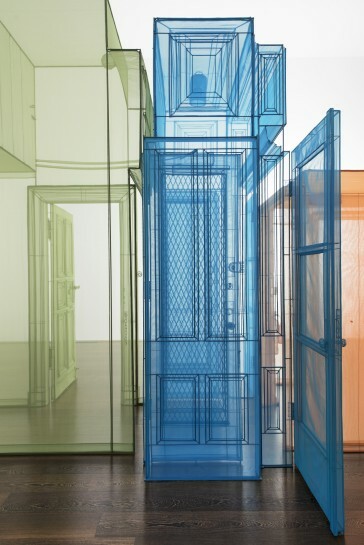 In february, Do Ho Suh created a walk-through configuration of semi-transparent structures to occupy the 25 meter-long gallery space at Victoria Miro. Using fabric, Suh replicates the architecture of places in which he lived, and his recent move to london provides an overarching theme for his exhibit. the colorful corridor-like spaces were accompanied by large-scale drawings. sewn in the same way as Suh’s ‘hubs’, these pieces are immersed in water, during which a gelatin tissue canvas leaves an impression of fabric threads that appear as a skeletal framework against the colored form of an object.